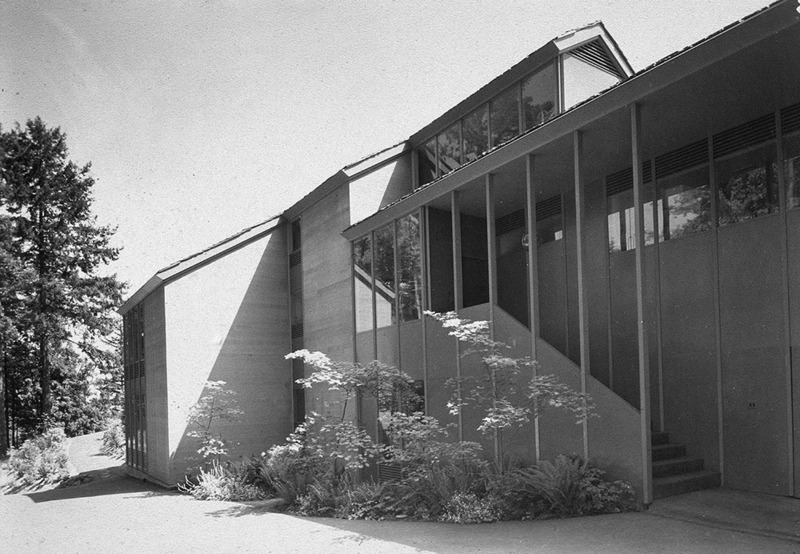 Located steps away from the Watzek House, the Cottrell House was designed for the noted orthopedic surgeon, filmmaker and adventurer George Cottrell, his wife, Margaret, and their three daughters. Sited on a seven-acre, hillside forest reserve, the house features a quartet of bedroom suites surrounding a generous room for entertaining. In the early stages of restoration, the home is primarily used for visiting UO faculty and guests. But it’s generous public rooms and the nearby forest walks make it a relaxing location for day retreats. Several design elements in Yeon’s work are strongly seen in the Cottrell House and are evidence of his continued expertise with building systems, daylighting, and interior and exterior spatial form. The exterior of the Cottrell House uses a rhythmical module of 3 feet in width. This is utilized in the tall, glass-louver-plywood panels forming the house’s exterior panels. Yeon’s characteristic wall unit – logically divided into a glass vision panel, a louvered ventilation panel, and a painted plywood insulation panel (or spandrel) – is a first-rate solution for the prefabricated house wall, something of an innovative effort in home-building at that time. Blank wall surfaces are horizontal 1” x 6” cedar, tongue and groove, with a bleached finish. Another classic Yeon design feature is the placement of the central, glassy, and open living area between three solid blocks of secondary rooms. Yeon is said to have appreciated this approach as it allows for light from different angles and for a variation of views and levels. The entire house, in Yeon’s words, is “hung back over the edge of the hilltop,” thus freeing the most useful parts of the site for a generous garden.